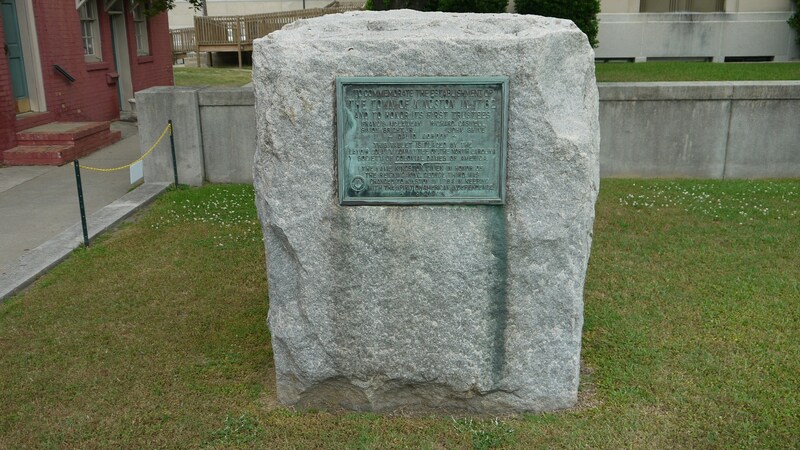 This large stone marker, composed of a short rough cut piece of granite approximately four feet tall by three feet wide, commemorates the founding of the town of Kingston (now Kinston) in 1762. 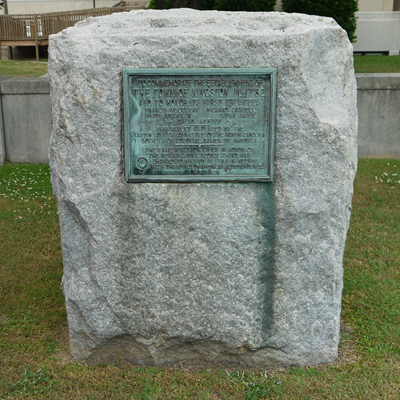 A bronze plaque on the front face of the granite commemorates the town's founding trustees. The monument was unveiled on September 12, 1929 in front of the Kinston Courthouse. The program began inside the courthouse and then proceeded outside to the monument. Dr. Eugene Clyde Brooks, President of State College in Raleigh, was the principal speaker and gave a history of Kinston since its founding. Mrs. Clarence A. Jeffress presented the monument on behalf of the Lenoir County Committee of the North Carolina Society of Colonial Dames of America. The monument was accepted by Mayor James C. Dail and H.E. Mosely, chairman of the Lenoir County Board of Commissioners. Guests included Colonel Fred A. Olds of the State Historical Society and the Reverend George W. Mauze of the First Presbyterian Church who gave the invocation. "America the Beautiful" was sung. The monument was unveiled by Anne Bright Dawson, the daughter of John G. Dawson, former speaker of the North Carolina House of Representatives. Dr. Brooks's speech was printed in the Kinston Free Press. The most notable name on the marker is Richard Caswell, the first and fifth governor of North Carolina. Caswell was a member of the Continental Congress, an officer in the patriot army in the Revolutionary War, and contributed to the writing of North Carolina’s first state constitution in 1776. The other names, Simon Bright Jr., Francis McLewean, David Gordon, and John Shine were appointed by then Governor Arthur Dobbs as the other trustees of the newly formed township of Kingston. Kingston was incorporated in 1762 by an act of the colonial North Carolina General Assembly and named in honor of King George III. The bill was introduced into the Assembly by then representative Richard Caswell. In 1784 the town changed its name to Kinston to reflect the change from monarchy to the republic. The marker stands on the left side of the Lenoir County Courthouse grounds and faces northeast. The Lenoir County World War I and World War II Memorial sits right to its right. The Governor Caswell Monument is also located on the courthouse grounds on the right side of the walkway. The monument is located on the front lawn of the Lenoir County Courthouse to the left side of the walkway.